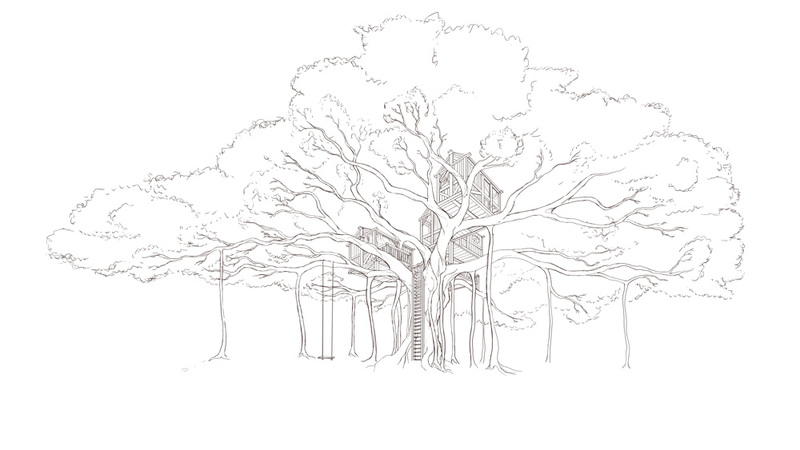 I have always loved tree houses. As a kid we've had several of varying complexity with many many hours spent playing in them a day. This was just a fun personal project. Playing with lines and creating complex detailed illustrations is something I love doing. With this particular one I'm using a new technique. To color I select the area so that only it can be colored and then using a round gradient apply the color in many many transparent layers and degrees of softness. A bit time consuming if you get lost in layers but I enjoyed the effect. I also relied heavily on a perspective grid for this piece. Being only a concept I wanted it to retain a strong structure and not get too loose. It helped quite a bit in keeping all those straight lines. Tell me about your childhood treehouse!